Evaluation of co-archiving concept ideas in collaboration with users (CC:BY-NC). As argued by Jaques Derrida (1995*, p. 4): “There is no political power without control of the archive, if not memory. Effective democratization can always be measured by this essential criterion: the participation in and access to the archive, its constitution, and its interpretation”. This statement serves as a starting point for a series of research interventions exploring and prototyping co-archiving practices aimed at involving underrepresented voices in contributing to our common archives, and in documenting the story of our times from their point of view. How to give voice to the marginal? How to create conditions for accessing records of human existence beyond traditional methods? How to support co-archivists that strive to seriously engage the subjects (the “archived”) in the shaping of the archives? The Co-archiving theme has evolved from research activities conducted in the Urban Archiving research theme in Living Archives. Our attention was then directed towards underrepresented, marginalised urban communities and neighbourhoods. The group focused on in the Co-archiving theme is refugees seeking asylum in Sweden. Our research approach is design research, which is based in action research and often driven by a critical agenda. Principles and methods from the fields of participatory design (PD) are applied implying that prototyping and design interventions are part of the research process. The direct involvement of the users is one of the central principles of PD. Instead of designing for the users, the designers and/or researchers work with the users in a collaborative (co-) design process of joint decision-making, mutual learning and co-creation. Researchers: Elisabet M. Nilsson (elisabet.nilsson@mau.se) and Sofie Marie Ottsen Hansen (sofie.marie.hansen.ottsen@mau.se). Collaborators and partners: The Refugee Documentation Project run by The Regional Museum in Kristianstad, Malmö Museums, Kulturen Museum and the Department of Cultural Sciences, Lund University. City of Malmö/Malmö stad, Malmö City Archives, Interaction Design Master students at Malmö University, Max Paulsson Hall, product designer. *Derrida, Jacques, Archive Fever: A Freudian Impression. Chicago and London: University of Chicago Press, 1995. July 2019: Workshop: Co-archiving workshop on the topic of “Landscaping shame: migrant people and informal rural settlement documentation (methodologies and experiences)”, part of the project Architecture of Shame, Matera 2019 Capitale Europea della Cultura. August 2018: Workshop: Identification as Process in Participatory Design, at the Participatory Design Conference in Hasselt and Genk, Belgium. June 25–28 2018: Paper presentation: “The Co-archiving Toolbox – Designing conditions for diversity in public archives” at Design Research Society 2018 Catalyst, DRS2018, University of Limerick, Ireland. May 2018: The Co-archiving Toolbox published as open source on Instructables. April 12–13 2018: Paper presentation: “Re-thinking archiving for increased diversity – Insights from a co-design project with museum professionals and refugees” at the Cumulus 2018 Conference in Paris, France. November 2017–April 2018: The Co-archiving Toolbox tested in the field. August 29 2017: Raya Dimitrova, Interaction Design Master student at K3/Malmö University, presented her thesis project: Designing a collaborative self-archiving system for vulnerable groups via co-design means. December 2016 – ongoing: The Co-archiving Refugee Documentation project, read more about the design workshops, and outcome up to now. June 14 2017: Co-archiving Refugee Documentation Workshop #4. June 1 2017: Paper presentation: “Becoming a co-archivist. ReDoing archival practices for democratising the access to and participation in archives” presented at the Cumulus 2017 Conference in Kolding, Denmark. April 24 2017: Co-archiving Refugee Documentation Workshop #3. April 7 2017: Co-archiving Refugee Documentation Workshop #2. March 21 2017: Ethics seminar “Unheard Voices: Research ethics when collaborating with vulnerable groups”. March 10 2017: Co-archiving Refugee Documentation Workshop #1. January–March 2017: Interaction Design Master students at K3/Malmö University developed a collection of co-archiving practices for refugee documentation, read more about the design process and outcome. November 19 2016: Paper presentation: “Co-designing newcomers archives: discussing ethical challenges when establishing collaboration with vulnerable user groups” at Cumulus Hong Kong 2016, Hong Kong. November 16 2016: Presenting the Co-archiving research theme at the K3 Research Fair. October 20 2016: Paper presentation: ”Prototyping collaborative (co)-archiving practices – From archival appraisal to co-archival facilitation” at The International Conference on Virtual Systems and Multimedia (VSMM), Sunway University in Kuala Lumpur, Malaysia. 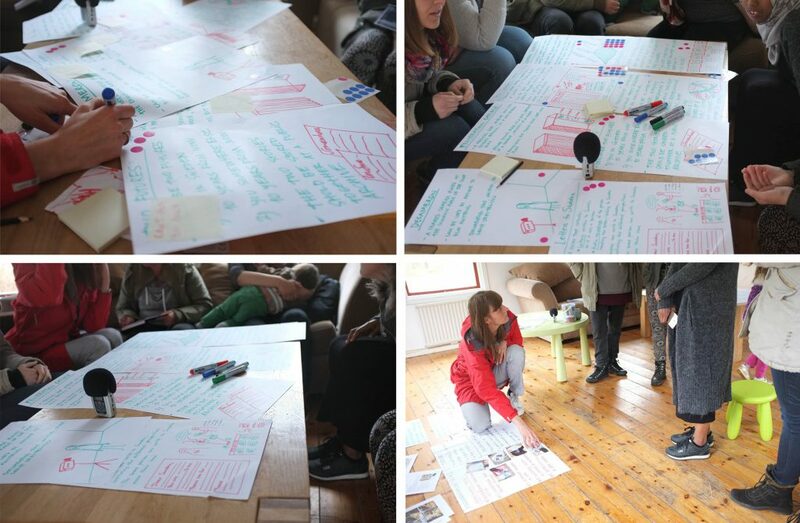 January–March 2016: Research-based teaching: Newcomer archives – Prototyping urban co-archiving practices for capturing and sharing Malmö. In collaboration with Interaction design master students at K3/Malmö University and The Malmö City Archives we explored and prototyped collaborative(co)-archiving practices aimed at involving more people in documenting the of Malmö. Read more. As part of our participation in the “Re-enactments – Archival Performances” at the AHA Festival the Memory Game was played. At the first gaming session the source was archival traces from the AHA festival 2014 archive. At the second gaming session (18 hours later) the players re-enact and share their memories and experiences from taking part in the archival performance during the last 22 hours. Read more. The Memory Game is a card game (a remake of the classical Memory game) and an archiving practice designed to work as a platform for dialogue, and a framework for collecting, storing and sharing memories and cultural heritage. The gameplay is an act of collective storytelling, and an associative play between the players and the memories performed and re-enacted. As part of our collaboration with Rochester Institute of Technology (RIT) the game is played and exhibited at the MU/RIT Partnership Symposium. Jørgensen, Stina Hasse; Marttila, Sanna Maria; Homewood, Sarah; Nilsson, Elisabet M.;Ottsen Hansen, Sofie Marie (2018). Identification as Process in Participatory Design. Workshop paper, Participatory Design Conference in Hasselt and Genk, Belgium, August 20-24. Nilsson, Elisabet M. & Ottsen Hansen, Sofie Marie (2018). The Co-archiving Toolbox – Designing conditions for diversity in public archives. Conference proceedings Design Research Society 2018 Catalyst, DRS2018, University of Limerick, Ireland, June 25-28. Nilsson, Elisabet M. & Ottsen Hansen, Sofie Marie (2018). Re-thinking archiving for increased diversity – Insights from a co-design project with museum professionals and refugees. Conference proceedings Cumulus Paris 2018, Paris, France, April 11-13. Nilsson, Elisabet M. & Ottsen Hansen, Sofie Marie (2017). Becoming a co-archivist. ReDoing archival practices for democratising the access to and participation in archives. Conference proceedings Cumulus Kolding 2017, Kolding, Denmark, May 30-June 2. Nilsson, Elisabet M. & Barton, Jody (2016). Co-designing newcomers archives: discussing ethical challenges when establishing collaboration with vulnerable user groups. Conference proceedings Cumulus Hong Kong 2016, Hong Kong, November 21-24. Nilsson, Elisabet M. (2016). Prototyping collaborative (co)-archiving practices – From archival appraisal to co-archival facilitation. Conference proceedings 22nd International Conference on Virtual Systems & Multimedia, Kuala Lumpur, October 17-21.